Spring Training begins this week, so it is time to start taking a closer look at the 2008 Tampa Bay Rays. What better way to do that than a good ole fashioned Power Ranking. 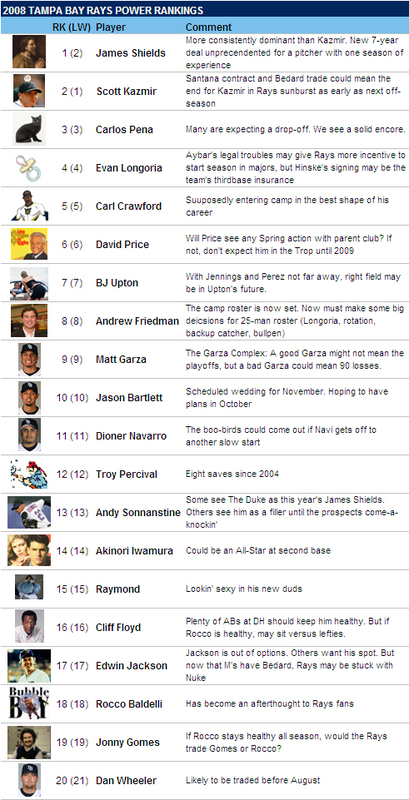 Everybody loves Power Rankings. These rankings are a combination of overall importance to the team and a general “who’s hot and who’s not”. 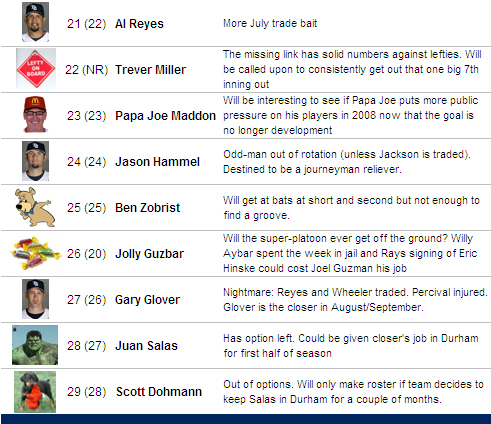 The Tampa Bay Rays Power Rankings will appear every Tuesday. With wheeler and reyes likely to be traded sometime late in the summer, would they before more bullpen help or some other position and the rays would just bring up relievers from durham. Are jennings and perez both centerfielders or are they both still young enough to learn the other outfield positions if they are to join BJ and possibly carl in the outfield? there is a noticeable lack of depth in the minors for relief pitchers at least at AA and AAA. There is Nick DeBarr and Dale Thayer. We will prolly see both of them at some point this season. And then there are some starters that are going to see a transition. Talbot may get a shot in the Rays pen at some point. Still I think one target when the trade deadline approaches is going to be young relief pitchers that can stick around for 3+ years. I think the bullpen is one place Maddon loves having experience but Friedman would like 4 or 5 of those spots to be manned by young, cheap players. Jennings and Perez are both natural center fielders. I dont think either has the arm to play right. one could potentially play right field if Crawford were ever traded. Upton on the other hand has one of the better arms in baseball. He could be a good right fielder. The big question is whether the team wants to move Upton again next year after he seems to have finally found a position that he is comfortable at. If not, the team may just have to deal with a weaker arm in right and let one of the youngsters play the corner. Do you think Hammel is worthy of the term "trade bait?" he has had 23 starts in parts of two seasons at the major league level and has yet to show any sign that he is a major league starting pitcher. well, he is out of options. If he doesn't make the rotation (he won't) and he gets beat out of a bullpen spot (quite possible) the Rays will have no choice but to flip him for a low-level prospect from a team looking for an extra bullpen arm with a cheap price tag. But I can't imagine there is a big market for his services, so the Rays are not going to get much in return.